2012 World Brewers Cup Champion – Matt Perger! – Dear Coffee, I Love You. 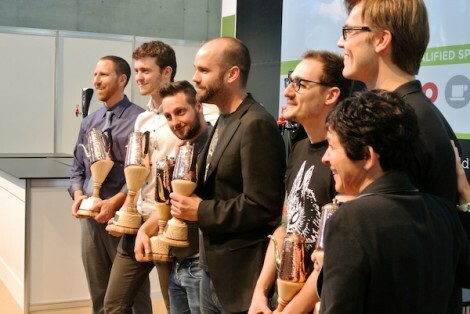 2012 World Brewers Cup Champion – Matt Perger! On the far side of the Vienna convention center, the World Brewer’s Cup took place for its second year. This younger brother of the World Barista Championship, showcases a barista’s ability to brew great filter coffee consistently. 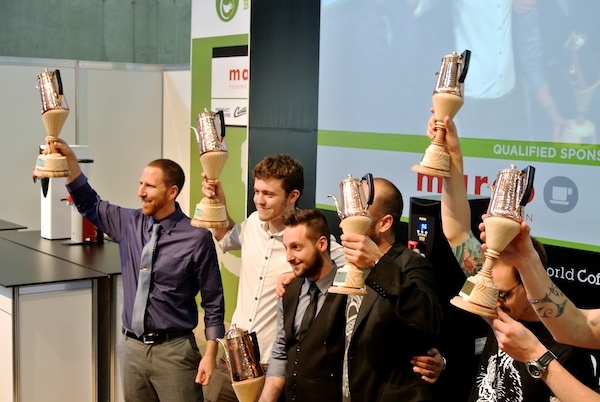 This year, Matt Perger from ST.ALi in Melbourne took home the title. 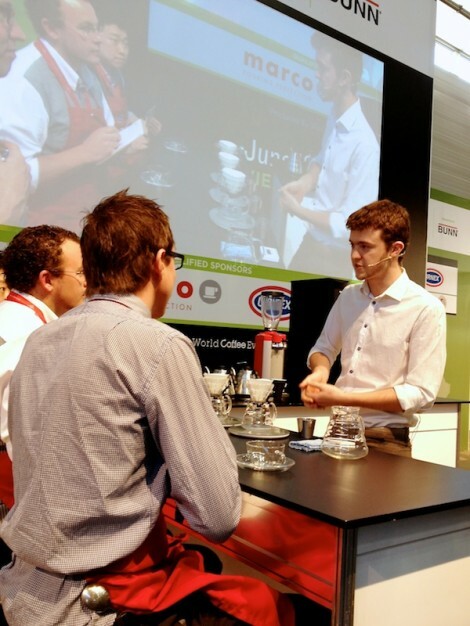 If his name sounds familiar, the 21 year old Australian placed third in last year’s World Barista Championship, proving his versatility as a barista and making him the first person to place so high in both competitions. Matt brewed his coffee, a washed Panama Geisha from Finca Santa Teresa, using a Hario v60. 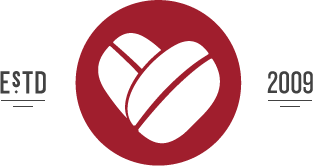 The presentation was built around the importance of grind uniformity and the damage that “fines” have on the extraction of coffee. The coffee was brewed to an extraction ratio of 23% (usually overextracted and bitter), while explaining how its possible to do this once the fines are removed. Matt also discussed the importance of water and the huge impact it has on extracting the proper flavors from coffee. He created his own blend after experimenting with 6 different waters to reach his desired ratio of 110ppm. 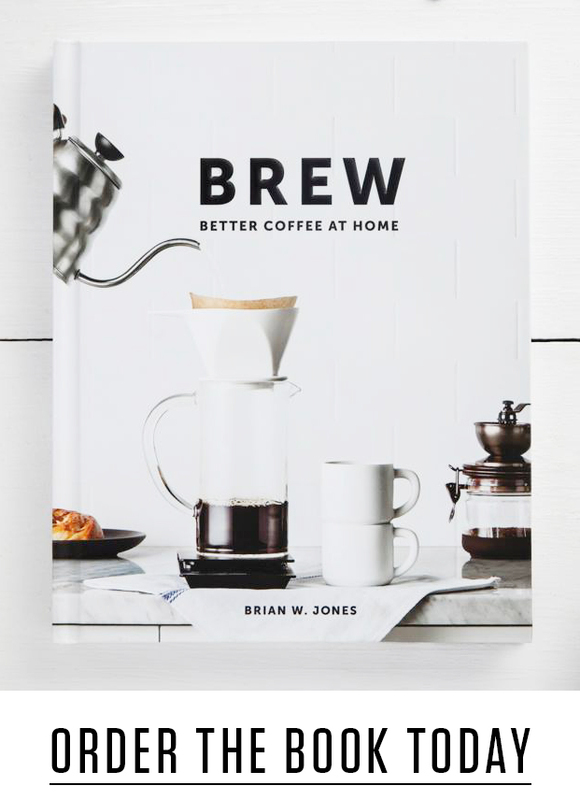 As someone who prefers to drink and prepare filter coffee—I really appreciated watching this event, which has a more informal and intimate atmosphere. The finals contained many great presentations, using a broad range of brew methods. There’s a lot of potential in this competition and I look forward to watching it grow. 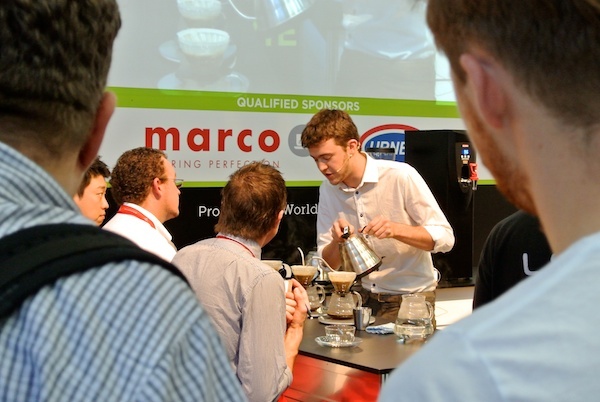 Congratulations to Matt Perger, your 2012 World Brewer’s Cup Champion! 2012 World Barista Champion – Raul Rodas!